All of our products carry a 30-day money-back guarantee and a two-year warranty. Shipping is the customers' responsibility. If you purchased your telescope through Stellarvue directly, within the first 30 days, if you need to return an item for any reason, login to your account, view the order using the "Complete Orders" link under the "My Account" menu and click the "Return Item(s)" button. You will be notified via e-mail of your refund once Stellarvue has received and processed the returned item. Allow up to 3 weeks for the refund. If you purchased your telescope through an authorized dealer, you must contact the dealer for their return policy. 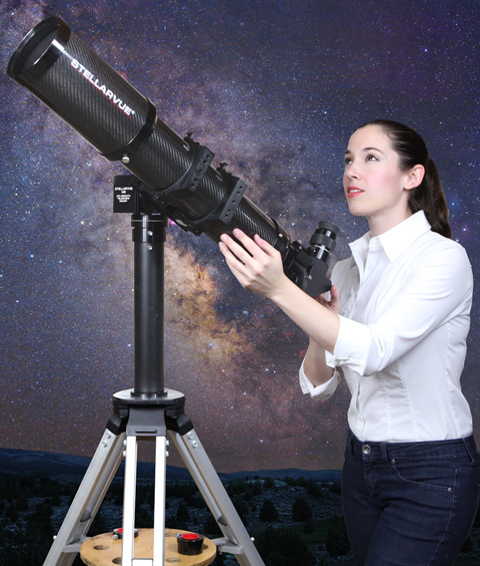 Returned telescopes are retested and sold as Certified Pre-owned. A 15% restocking and retesting fee is charged on the return of telescopes. Some high-demand telescopes have a waitlist and require a deposit. See our availability page for more information. Returns and services for international customers will be at the discretion of Stellarvue. Stellarvue (SV) warrants that each SV brand telescope and accessory shall be free from defects in materials and workmanship for two years from the date of purchase. SV will repair or replace such product or part thereof, which upon inspection by SV is found defective in materials or workmanship. As a condition to the obligation of SV to repair or replace such product, the product must be returned to SV as specified in this warranty. THIS LIMITED WARRANTY, AND ANY IMPLIED WARRANTIES THAT MAY EXIST UNDER STATE LAW APPLY ONLY TO THE ORIGINAL PURCHASER AND LASTS ONLY AS LONG AS THE PURCHASER OWNS THE PRODUCT. • Proof of purchase acceptable to SV must accompany any return for warranty work. • A Return Authorization must be obtained from SV in advance of return. E-mail Stellarvue at mail@stellarvue.com or call (530) 823-7796 to receive the authorization & packing instructions. • The authorization code must be written on the outside of the container. • All returns must be accompanied by a written note stating the model number of the product, authorization code, name, address, e-mail address and daytime telephone number of the owner, and an explanation of the problem. Replaced parts shall become the property of SV. • The customer shall be responsible for all costs of transportation and insurance, both to and from SV. • SV shall use reasonable efforts to repair or replace any product covered by this limited warranty within thirty days of acceptance. If repair will take longer, SV shall notify the customer. • SV may replace any product that has been discontinued with a new product of comparable value and function. Products that have been damaged, dropped, disassembled, abused, misused, mishandled, subjected to temperature or weather extremes, subjected to unusual wear or modified in any way will not be covered by this warranty. In these instances, this warranty shall be null and void. THESE WARRANTIES REPLACE ALL OTHER WARRANTIES EXPRESSED OR IMPLIED INCLUDING, BUT NOT LIMITED TO THE IMPLIED WARRANTIES OF MERCHANTABILITY AND FITNESS FOR A PARTICULAR PURPOSE. SV MAKES NO EXPRESS WARRANTIES BEYOND THOSE STATED HERE AND DISCLAIMS ALL OTHER WARRANTIES, EXPRESSED OR IMPLIED, INCLUDING, WITHOUT LIMITATION, IMPLIED WARRANTIES OF MERCHANTABILITY, AND FITNESS FOR A PARTICULAR PURPOSE. THE SOLE OBLIGATION OF SV UNDER THIS LIMITED WARRANTY SHALL BE TO REPAIR OR REPLACE THE COVERED PRODUCT, IN ACCORDANCE WITH THE TERMS SET FORTH HEREIN. SV DISCLAIMS ANY LOST PROFITS, GENERAL, SPECIAL, INDIRECT OR CONSEQUENTIAL DAMAGES WHICH MAY RESULT FROM BREACH OF ANY WARRANTY, OR ARISING OUT OF THE USE OR INABILITY TO USE ANY SV PRODUCT FOR ANY PARTICULAR PURPOSE. THIS WARRANTY GIVES YOU SPECIFIC LEGAL RIGHTS AND YOU MAY ALSO HAVE OTHER RIGHTS THAT VARY FROM JURISDICTION TO JURISDICTION. WARNING: LOOKING AT THE SUN CAN CAUSE SERIOUS EYE INJURY AND BLINDNESS. NEVER POINT A TELESCOPE AT OR NEAR THE SUN. VIEWING THE SUN WITHOUT A PROPER SOLAR FILTER MAY RESULT IN BLINDNESS, AS WELL AS DAMAGE TO THE INSTRUMENT. NEVER ALLOW CHILDREN TO USE BINOCULARS OR TELESCOPES DURING THE DAYLIGHT HOURS, UNLESS THEY ARE SUPERVISED BY AN ADULT WHO UNDERSTANDS THE DANGER OF POINTING ANY OPTICAL INSTRUMENT IN THE GENERAL DIRECTION OF THE SUN.